Walker is represented by Arthouse Gallery in Sydney. Her work features in several major public and corporate collections including Macquarie Bank, The Australian Club, Grafton Regional Gallery, Lismore Regional Gallery, Tweed Regional Gallery, Bond University, Lowensteins and Gold Coast City Gallery in addition to various private collections in Australia, Indonesia, The Netherlands, Hong Kong, United Kingdom and The United States. In 2014 Walker won the prestigious JADA drawing prize. Walker’s practice consistently engages with the natural world. An explorer at heart Walker has informed her visual language through extensive travel and an inbuilt desire to constantly engage with the world around her. Poetry, philosophy, photography and music are all vital components of her process. Walker’s paintings are multi-layered, being as much about the medium of paint and the process of painting as with an experience of the Australian landscape and the world of nature. Her work explores the connections between landscape, memory and the subconscious. She has an instinctive understanding of colour, line and texture and there is an extreme play of light and dark in her abstracted landscapes which creates a dreamlike dimension. Walker’s objective has never been to depict but to evoke. Whether it be a sense of place, an atmosphere, a feeling or a memory. Her work references nature, science and the ineffable nature of that which lies beneath the surface of appearances. The techniques that she employs: of painting in layers, obscuring and revealing, addition and erasure, these all reflect the thought processes and ideas that underpin her work. 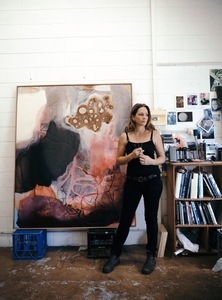 "Emma Walker is one of Australia's most convincing and original painters. Her work is as audacious as it is poetic; the one quality leavens the other, so that just as delicate reverie sets in, you're pulled up by a less immediately seductive note, an act of painterly boldness or some other form of tough, enlivening aesthetic decision… these are intelligent paintings - intelligent in their understanding of ambiguities, of space, and of colour."